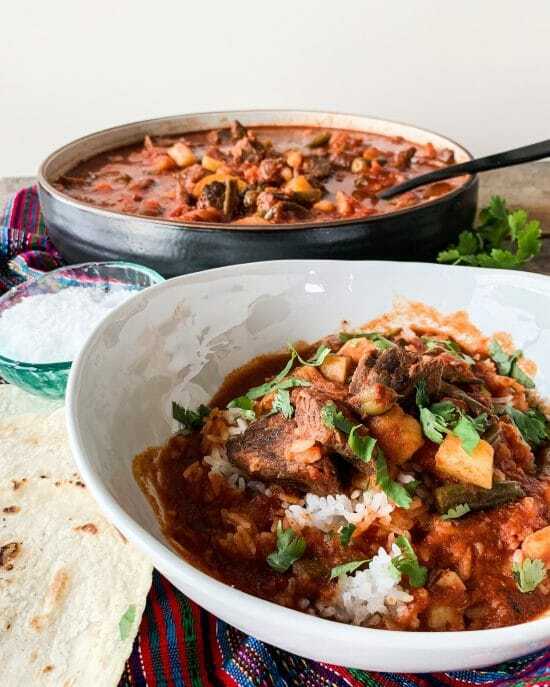 Slow Cooker Traditional Tejano Carne Guisada Stewed Beef for Tacos from The Food Charlatan is perfect when you want a cook-all-day slow cooker dinner, or it can be cooked on the stove. The juicy, tender beef chunks can be eaten in a taco, burrito bowl, on a salad, or just straight off the fork! And this the slow cooker stewed beef can be low-carb, gluten-free, South Beach Diet friendly, and even Paleo if you use approved bouillon and tomato sauce. The Carne Guisada at Gonna Want Seconds is made in the Instant Pot and this recipe also doesn’t use any flour or cornstarch so it can be the start of a low-carb meal. I think Kathleen’s Carne Gasada looks and sounds delicious, and she says this is the perfect filling for tacos or burritos! My friend Mike at The Iron You has this delicious-looking Easier Healthier Crock Pot Carne Guisada, which is also a low-carb version of this tasty dish. Mike serves it in a bowl, but you could definitely grab some low-carb tortillas and make tacos if you prefer! And one more option for Instant Pot Carne Guisada comes from Mary-Beth at Heart of Celebration. As you can see she makes hers into a stew with a few potatoes and carrots and serves over rice, which also sounds like a delicious option for this tasty dish! But you could certainly skip the high-carb veggies and serve this in low-carb tortillas if you prefer. Have you made Carne Guisada in the slow cooker or the Instant Pot? Let us know in the comments about how that turned out for you! Karen, my pleasure! And I can definitely see why this would be a favorite! Well, I missed Cinco de Mayo, but I'm putting this on my list of slow cooker recipes to try. Looks amazing! I love the sound of it, and that the ingredient list has things most people will have!